Wyldewood Cellars is a Kansas based vineyard and winery that has won numerous awards for their various wines and meads over the years. I managed to come across few of their commercially available flavors in a liquor store, but they also offer many of their products online (shipping availability may vary by state). 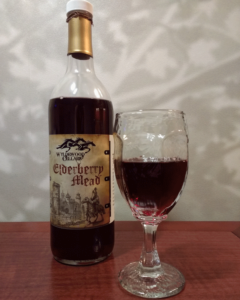 This mead is sweet, with a very bright and potent elderberry flavor upfront. On the back end, a pleasant tartness, reminiscent of apples. It has a nice, medium body to it. Good weight on the tongue, and not watery at all. Can’t taste the alcohol in it at all, so careful with this one. If it weren’t for the scent, you’d swear it was a juice. On the spectrum of varieties of mead, it is solidly in the wine-like category. Not knowing any better, you might think it was a sweet red wine. The aroma helps with that quite a bit. Overall, it was very pleasant to drink and easily sessionable. Worth picking up if you have the opportunity.